Medical assistance was not widely available in rural Canada in the early decades of the 20th century. Outpost Hospitals, like the one pioneered here in Wilberforce, provided much needed health care and education to rural communities. Established in 1922, the Wilberforce Red Cross Outpost, a nursing station and hospital, set the example for similar programs in Ontario and across Canada. A Red Cross Outpost Nurse led a very busy and varied life. As a public health nurse, her responsibilities included examining children in the schools, responding to first aid emergencies, promoting general health practices, and delivering babies--whether at the Outpost or in a patient's home. Always packed and ready to go, the Maternity Kit was taken by the Red Cross Nurse when called to deliver a baby in the home of the mother. All of the items showcased here were considered very important aids for a safe delivery. At the delivery, the Nurse was often on her own with only the help of a family member or neighbour. Doctors would be called in from surrounding villages, but sometimes they were not available or they did not always arrive in time. A basic set of baby clothes was always included in the suitcase and given to the mother. The set included an undershirt, an umbilical wrap, a nightgown, and at least one cloth napkin (diaper). It was a much appreciated gift. Upon return to the Outpost, the kit was immediately repacked in readiness for the next call. 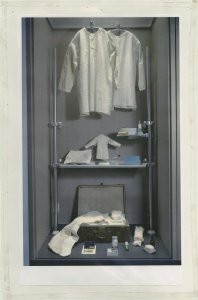 The linens were soaked and laundered while the utensils and instruments were washed, wrapped, and sterilized. Sterilizing was done on the Outpost kitchen stove. These duties were usually performed by the Outpost's housekeeper. The Wilberforce Red Cross Outpost Historic House Museum is pleased to display the maternity kit here at our National Historic Site. Drop in for a visit in person and see it for yourself!